Posted on March 28, 2018 at 11:58 am. 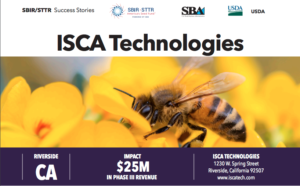 ISCA’s bee pollination enhancement technology was honored as a success story of the federal Small Business Innovation Research (SBIR) program. The program provides grants to small businesses to fund new innovations. Click here to see the SBIR article about this ISCA innovation called APIS Bloom that increases crop yields by increasing bee pollination rates. Developed under grant support from the U.S. Department Agriculture, APIS Bloom focuses bees toward the desired crop areas. Growers apply this safe product directly to the crops during the blossoming period. It then steadily releases a bee pheromone called Nasonov. This is the same compound the worker bees release in nature to tell other bees they have discovered productive sources of pollen and nectar, and it also guides bees back to their hives. The pheromone directs the bees to desire crop blossoms while discouraging them from going beyond orchard boundaries. It also compels them to forage at greater distances from the hive, which provide growers with greater coverage per hive. Bees also go work for longer periods of time. And they are more active during cooler and cloudy conditions that otherwise stifle their activity.